I'm striving to invoke a method from a service task. I've followed a few suggestions and examples, mainly Maciej Swiderski's-->HERE. I think everything set up correctly, for the most part, but my custom method is not being called. 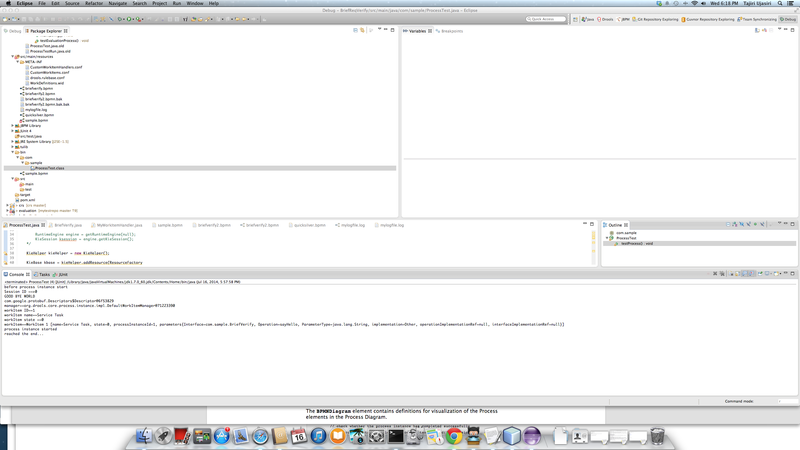 created the class with will execute my "task"
Can you explain what is the issue that you are getting? I cannot see any custom method invocation. Please can you verify your code on github is correct or provide any trace? Yes, that is the code. I don't have a stack trace. I thought the actual invocation happened in the BPMN file. Should I be doing some work in the executeWorkItem() method? I was able to dump the workitem object the Interface and Operation properties corresponding with the <interface> and <operation> elements are set. I don't know what's supposed to make the method call. Thank you very much lauradp. My task is launching now and I'm proceeding. I don't now how I missed the actually invocation of the method having to be in "executeWorkItem()"!